Roofing is a valuable, often overlooked part of your business. Those who consider theirs often save themselves from heaps of negative consequences. There are many naturally occurring causes that can seriously cause damage to your Industrial Roof, especially over time. Can you imagine not having a roof in the UK’s unpredictable weather? It’d be disastrous, for you and your disgruntled employees! Work would risk stopping, which would lead to tremendous losses in a short time. The safety of workers would mean that the business would most likely be unable to function. The costs of a full repair would also be a blow to your businesses finances. This is why it’s so important for your roofing to be done entirely by proven practitioners in the trade. Industrial Roofing is often used in the manufacturing industry in factory environments. It requires especially durable materials and specific construction methods than normal roofing, ensuring consistent quality for you and your business. Industrial environments are not fit to handle major roofing issues as it can lead to business disruption or damaged equipment and products. It can even be hazardous for employees’ health. These issues cannot be overstated. Industrial roofing is an area where everything needs to be done in a considered, quality manner that will stand the test of time. The first step is to carefully choose your contractor. Industrial roofing is usually done in manufacturing, storage or distribution workplace environments. A good example is a car manufacturing facility. Factories such as these can lose vast amounts of money from even minor setbacks where production isn’t taking place. Your businesses roof is well worth investing in and taking into consideration with your budget. Bad weather conditions cause gradual deterioration and are added to by other issues like blocked gutters which lead to leaks and other problems. It can cause debris to block and disrupt your roof which can lead to costly things like replacing the guttering entirely. Regular cleaning and maintenance from a skilled contractor is essential to protect your industrial roofing. Sage BEC (formerly Sage Roofing) has a range of accreditation’s and experience, and we are very versatile in our approach to industrial refurbishment or installation. We regularly refurbish roofs to the highest possible standard. We have completed many projects without disruption to the business and have also done our refurbishment work spread out over annual periods to suit budget requirements. We’re fully confident in our materials and processes, which is why we offer guarantees of 10 to 40 years on primary weatherproofing materials across the board. There is also a five year labour and materials guarantee if a contract or collateral warranty isn’t present. 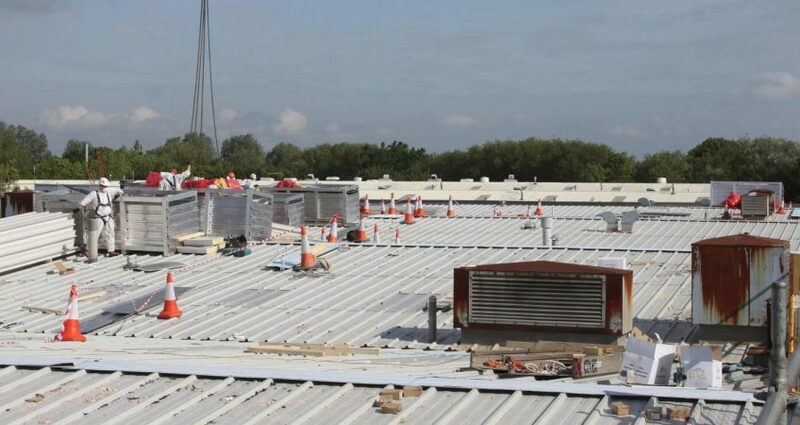 Sage BEC are renowned for solving all the issues associated with industrial roofing and cladding, with excellent customer service and a focus of ensuring your business can function how it needs to – when you need it to. Call us today on 024 7699 7677.